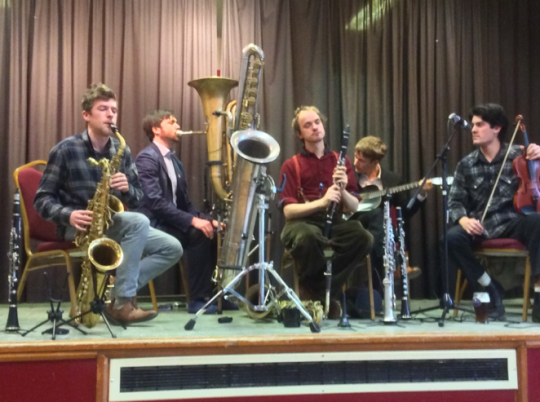 24 February – Arthur Brown & Matt Palmer’s “Jazz Buddies”: These are musicians we know well at SJS. 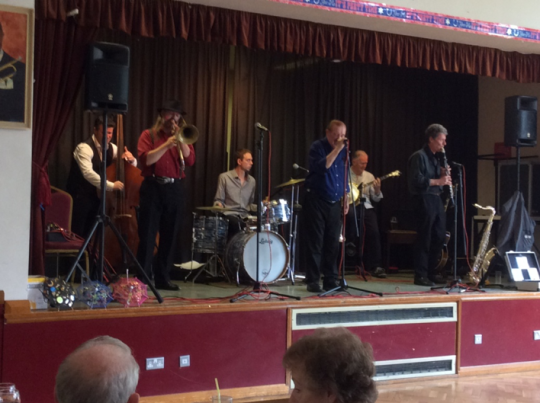 Arthur Brown on trumpet & vocals, Matt Palmer, on reeds and vocals, Mike Owen on trombone, Brian Mellor on guitar & banjo & vocals, Peter Robinson on double bass and Tim Jones on drums. They gave us a good range of music from “As Long as I Live”, to “Georgia”, “When it’s Thursday Night in Egypt”, “Beale Street Blues”, “Dapper Dan” and “I Can’t Believe You’re in Love with Me”. 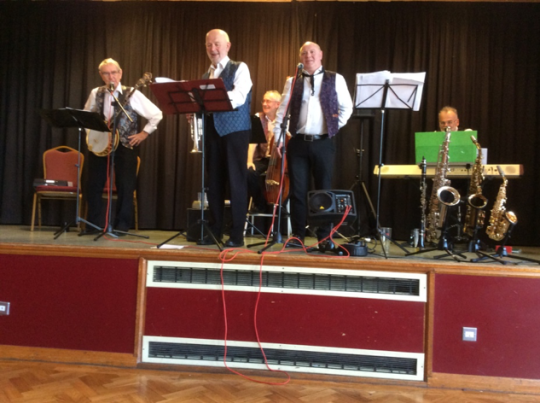 As always the band was well received and their finishing number was “Buddies Habit”. 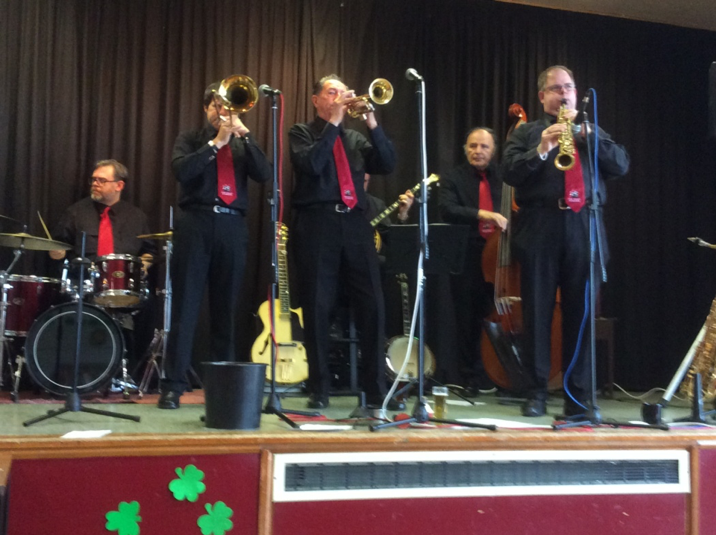 17 February – Frog & Henry String & Brass Band: This is the first time we have seen this band, formed in 2013, and what a treat. There was Ewan Bleach on reeds, vocals and piano, F.H. 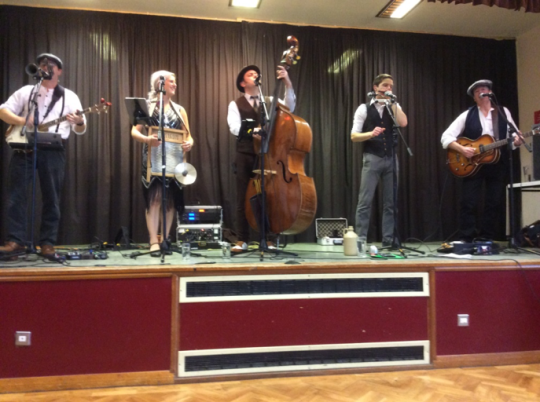 Henry on guitar and vocals, Laurin Habert on reeds, David Neigh on the tuba machine and 6-string banjo and Kermane Arken on violin and vocals. At one point I counted at least eleven instruments on stage, meaning each member of the band was playing several different ones. 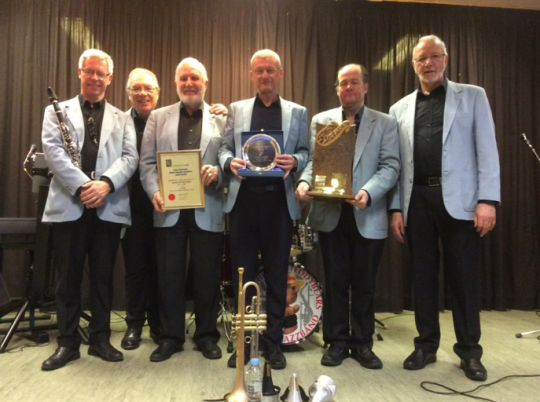 The members of the band come from USA, Canada, Germany and the UK. Their music was essentially their own version of early 1900s dance and street jazz music of New Orleans. Much interest was displayed in getting a closer look at David’s foot-operated tuba which allowed him to play a six-string banjo at the same time. There were numbers like “Hot Tempered Blues”, “Weary Blues”, “In my Little Red Book”, “As you Sew so Shall you Reap”, “Just Another Memory”, and “By the River Sainte Marie”, together with much more. Because they used Electro-voice microphones when singing this added to the 1900s aura. 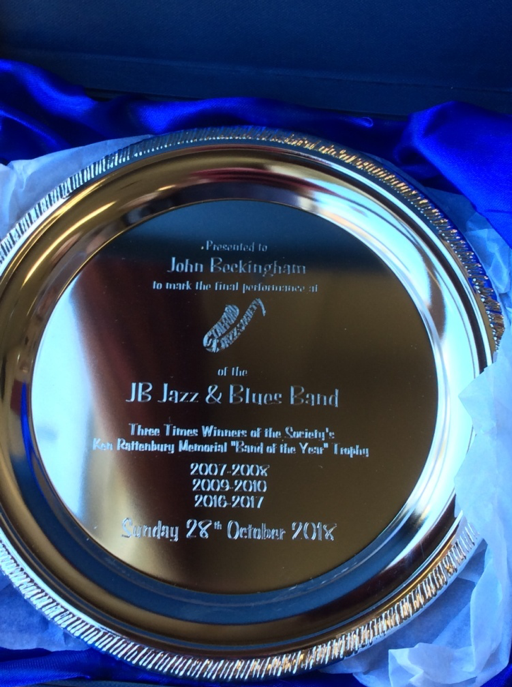 For young men they played brilliantly and give you hope for the future of jazz. I hope we see much more of them in the future. 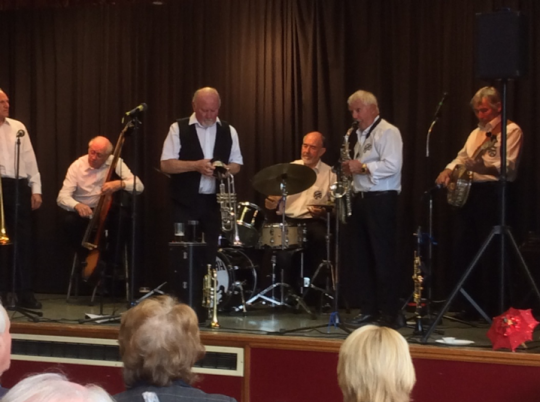 3 February – Wabash Jazzmen: Sadly I missed this concert as I was up at Lytham St Annes – a lovely place but the weather was really cold that week!! 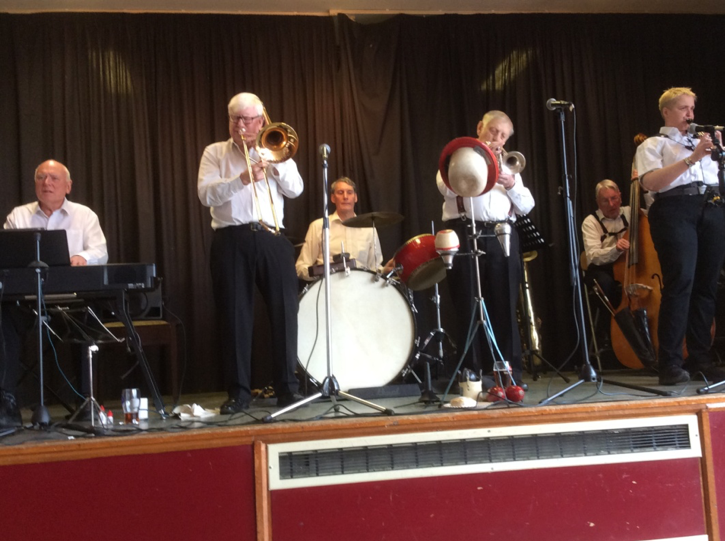 I can however report on a very favourable reception of this band, which is well known to SJS. The atmosphere was said to be good and everyone seems to have enjoyed themselves, certainly if the scores they achieved were any indication. 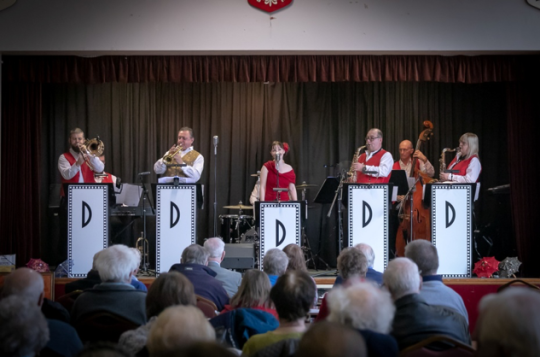 27 January 2019 – The Debonaires Little Big Band: It was good to welcome back this classy and versatile little big bang and their little singer, Sarah Eastwood, with a huge voice. 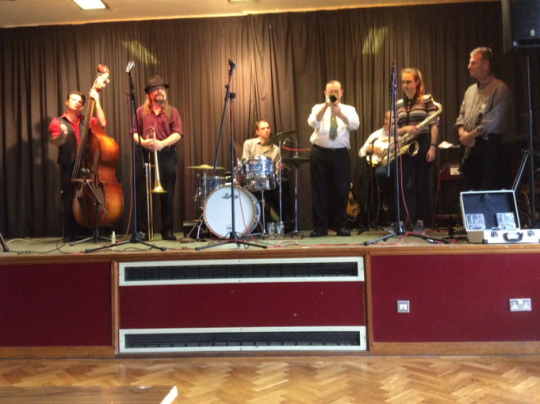 The band consists of Max Debon – leader (trumpet), Austin Ralphson (trombone), Rick Hallwell (alto sax), Peter Robinson (double bass), Rob Turner (drums), Peter Wilson (keyboard) and Anne Holder (saxophone). 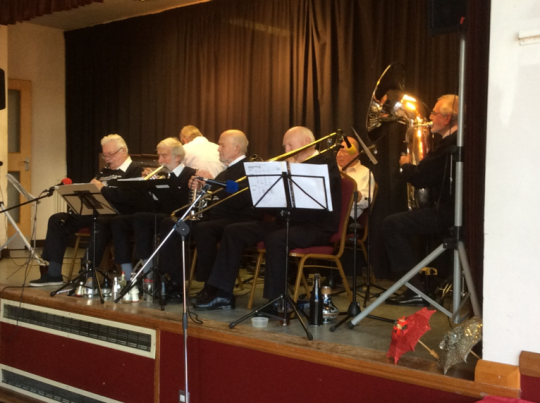 As well as singing Sarah also plays the clarinet. Some of the tunes were: “Cheek to Cheek”, “You’ve got to see your Moma every night or you ain’t gonna see her at all”, “It don’t mean a Thing if it ain’t got that Swing”, “Diamonds are a Girls Best Friend”, “Mambo Italiano” and the theme tune to Austen Powers, International Man of Mystery – Soul Bosa Nova. 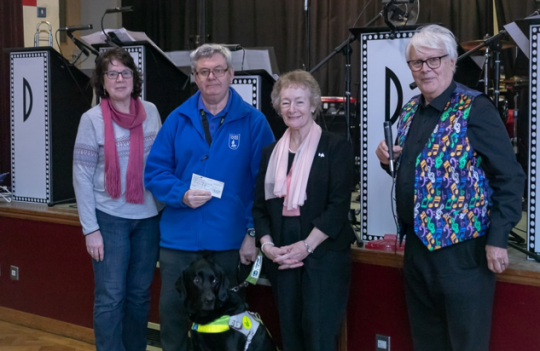 During the interval there was a presentation of a cheque for £1,000 from Stafford Jazz Society made by Nick Balmforth and Gwen Kenyon in support of a guide dog for the blind. Accepting the cheque was Colin Proudlock with his dog, Oakley, and Helen Stokes, Secretary of the Association. There will be a collecting tin for ongoing support for this project. 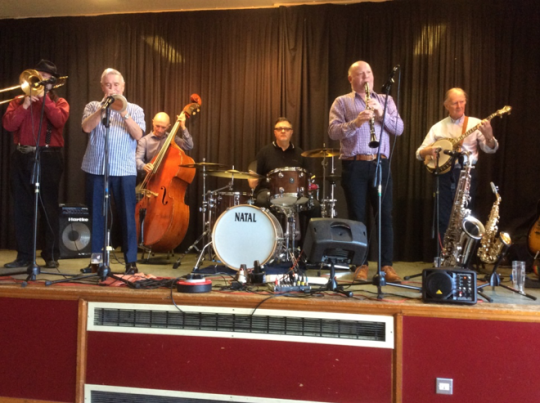 20 January 2019 – The Alex Clarke Hot Five: This was a great performance from a fairly young band. 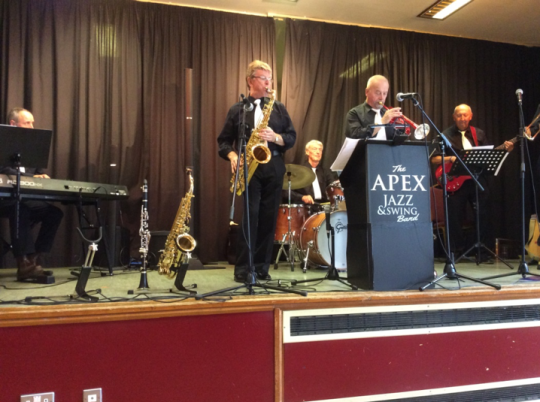 The band consists of Alex Clarke (reeds & flute) – leader, Mike Owen (trombone), Tom Kincaid (piano), Richard Vernon (double bass) and Jack Cotterill (drums). What seems to happen is they take songs we all know and love and just put their bit of magic into them. Numbers included “Way Down Yonder in New Orleans”, “Sheik of Araby”, “Nobody’s Sweetheart Now”, “Some of These Days”, “I’ll Fly Away” and “The Man I love”. 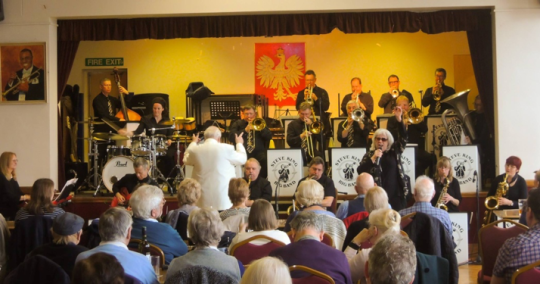 The White Eagle Club was pretty full and the band were well received. I know most people will be delighted to see them back on stage again soon. 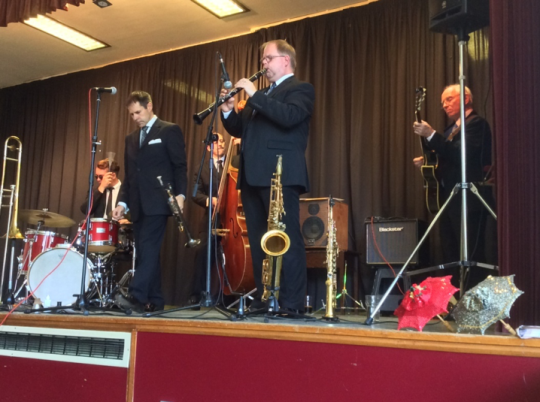 13 January 2019 – Matt Palmer’s “Aces of Rhythm”: It was lovely to see Matt, in one of his combination bands, along with Chris Mercer (cornet), Dave Kimmins (banjo + guitar), Al Harris (double bass) and Jo Nutman (not just a keyboard player but a genuine ragtime pianist). Dave, in particular, was able to give much knowledgeable insight into the numbers although Matt was no slouch in that department either. Some of the numbers they played for us included: "Keg Walking Babies", “Candy Lips”, “Got Butter On It”, “Wolverine Blues” and “I Never Knew What a Girl Could do”. Many of these numbers were new to me so as well as enjoying the music it was a learning curve. 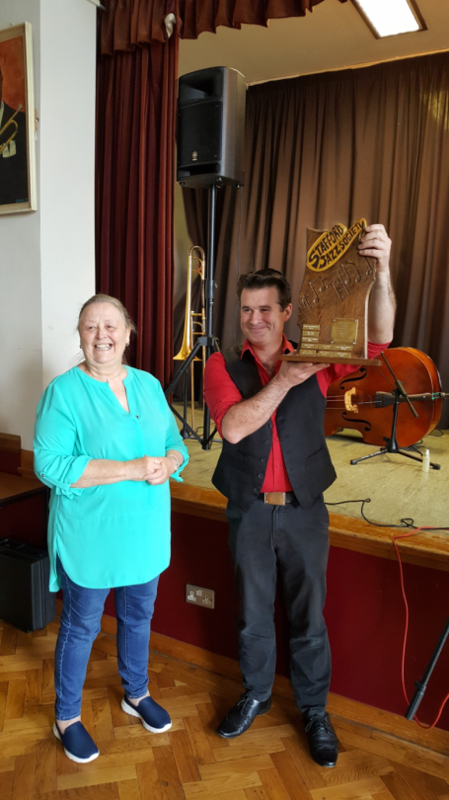 Matt will be back in March with his “Rhythmic Reeds” and Christine Tyrrell. 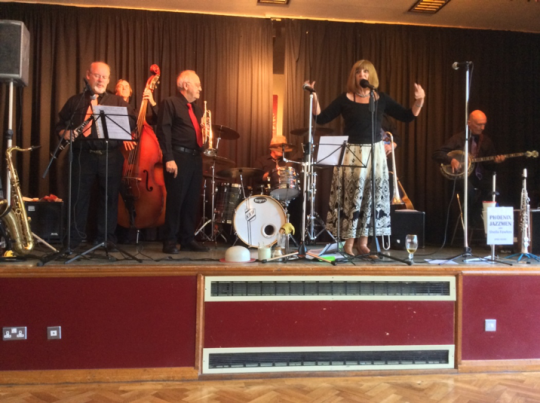 6 January 2019 – Chris Pearce & Andy Leggett’s “Sopranos”: It was a lovely way to start the second half of this year’s programme. 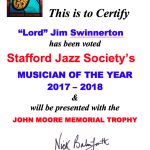 This band has long been a favourite of Stafford Jazz Society. 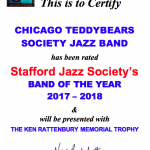 As well as Chris Pearce (leader) on reeds, Andy Leggett also on reeds, Dave Deakin on trombone and Tony Sharp on double bass we had Dave Andrews on drums and Rachel Haywood on guitar and banjo. 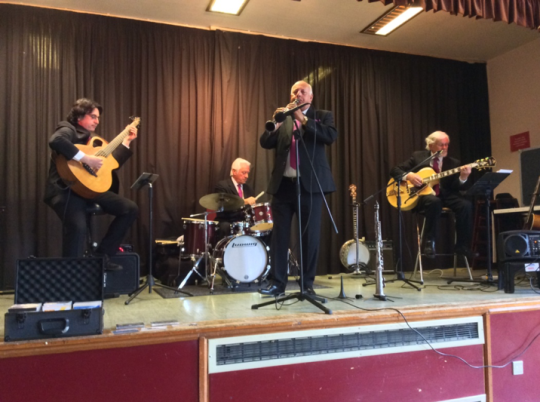 A quick flavour of some of the numbers they played: "Way Down Upon the Swanee River"; “Trogs Blues”; “Oh You Beautiful Doll”; “Buddy Bolan Stomp”; “Angel Flying too Close to the Ground”; "Russian Lullabye" and “In my Darkest Hour” there was a fine rendition of “The Mooch”. Terrific jazz all with the unmistakable quips by the two reeds players. 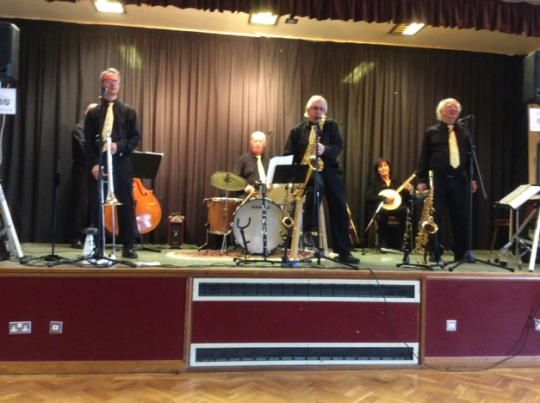 Mike Owen’s Scarlette’s Serenaders – 25 November: Jazz reminiscent of the New Orleans dance hall bands. 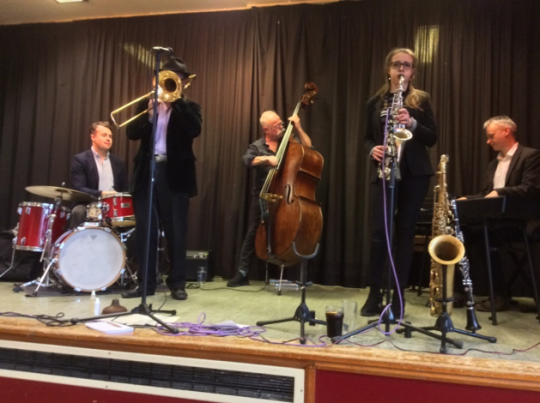 Musicians are: Mike Owen (trombone), Sarah Spencer (reeds), Brian Mellor (guitar & banjo), Jim Swinnerton (bass) and Baby Jools (drums). Sadly there is no photograph for this gig. 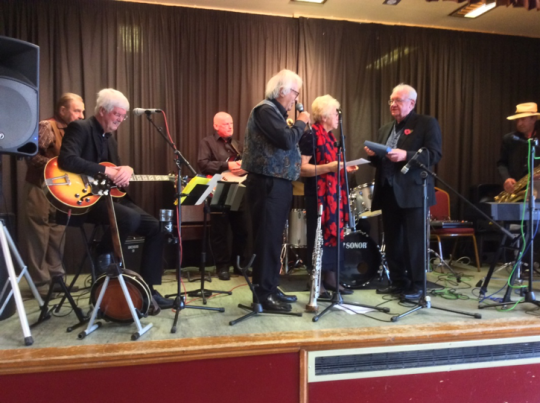 Frog Island Jazz Band – 11 November: This band was formed in 1962 and still has two existing members from those days. This is proper New Orleans-style jazz at it’s best. 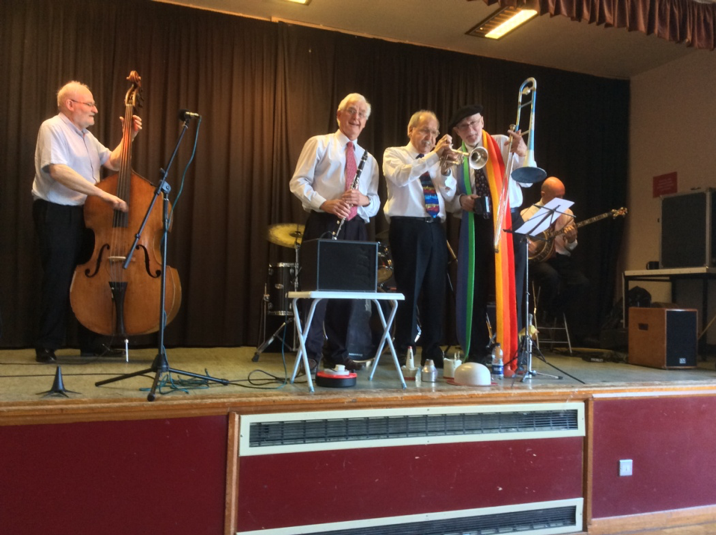 The band comprised John Whitehead (cornet & leader), Jim Hurd (clarinet), John Jeanes (trombone), Rob Fullalove (brass base), Keith Durston (keyboard) and Brian Lawrence (banjo). During the second half Chris Mercer on his coronet joined the band. Music included “The Charge”, “The Dip”, “Room Rent Blues”, “Spanish Shore”, “Mandy Make Up Your Mind” and timely “Santa Claus Blues” to name just a few. 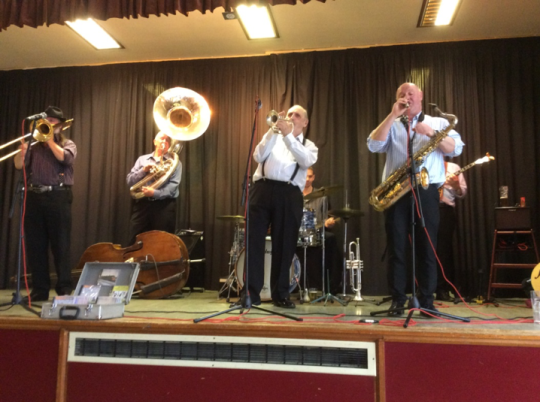 Thame Valley Stompers – 2 November: This band has such a sense of fun. 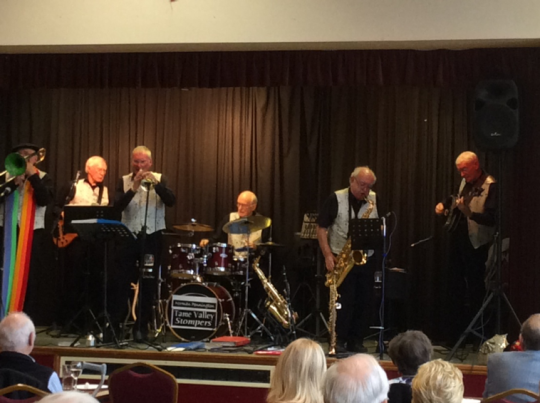 This band is top entertainment and quality. 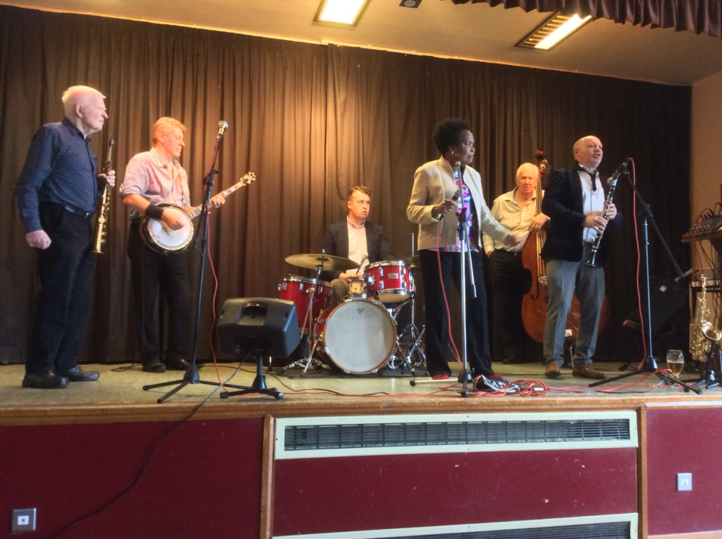 Some of the numbers were: "Dr Jazz", “The Entertainer”, “When There’s a Shine on Your Shoes”, “Don’t Bring Lulu”, the “Stevedore Stomp” and “I’ve Found a new Baby. 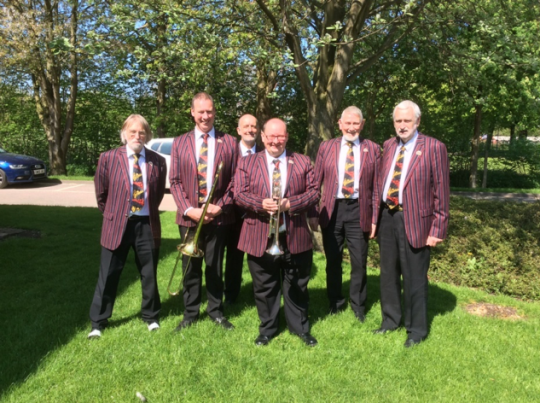 Band members are Terry Brunt (trombone), Norman Pennington (drums), Paul Broomhead (reeds), Roger Wimpenny (trumpet – and the jokes! 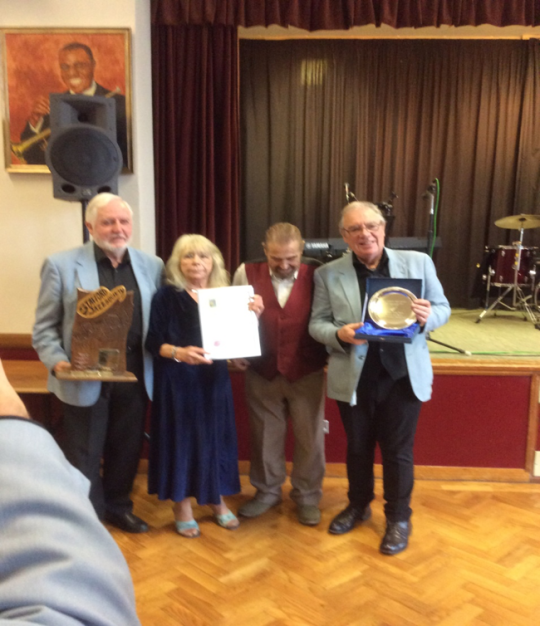 ), John Gordon (banjo/guitar) and Peter Smith (bass guitar).